Hu vows "a panda on Mars by 2034"
As the sun rises over the Huangpu River, the sleek and stylish Pudong edifices stretch skyward out of sight, the majestic presence of the Bund breathes a new dawn and the pulse of the city slowly starts to beat again... you feel an uneasy sense of bewilderment and solemnity. As the people who give this city its vivacity (the Shanghainese) begin to awake (all except the numerous workers who have been working all night), there is a feeling of unity, of harmony and an innate collective understanding of the common good. By 7.15, the taxi drivers are driving in a manner which is best summed up as "would drive over his own mother to get where he is going more quickly", the pedestrians are scrambling over each other for buses and tubes, and in office buildings all across the city, secretaries eager for promotion are pushing into elevator queues in order to walk into the office at exactly 9am. This quiet contradiction begs the question... what is Shanghai? Where did it come from? Where is it now? And most importantly, where is it going? And when will it get there? And how? Wang Bingbing, a spot welder turned celebrity fashion columnist, thinks that Shanghai has always had a clear understanding of its influences. "Shanghai's historical multi-cultural malaise is the major force behind the city's cosmopolitan character, a character which belies an impulsive yet calculated yearning for diversity and Von Dutch apparel." Yi Wei, an entrepreneur whose major business interests include kimchi broking and warehouse evaluation, sees Shanghai's character as more business-influenced, "Shanghai business is not for the faint-hearted. In this city, a guy who is one day polishing the shoes of reluctant customers can turn into a baijiu baron overnight and a guy who has enough money to hire three assistants to walk around with him and make him look powerful (we're talking filthy rich here) can one day find himself cleaning the house of an ayi. It's tough out there. 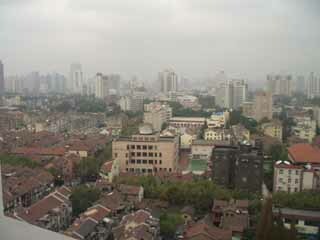 As the saying goes, Shanghai is a tiger but a tiger with a dolphin's head". If Mr Yi's maxim is true, how will Shanghai handle the intense competition in order to maintain its rapid pace of development? Ruo Jinggan, an insect taxidermist who moved to Shanghai from Anhui ten years ago said, "Back in Anhui, insect taxidermy was a mug's game. Insects were plentiful but the demand for the product was not there. When I moved to Shanghai, my business grew 3000% in the first year. I became known as "King Cockroach", but in recent years the rise in incomes has led to a rise in live cockroaches and demand has tailed off. If Shanghai is to even maintain its present growth rate, the government must adopt a strict policy towards killing insects." Finally, I spoke to Jasmine Gao, a normal member of the public, whose interests include shopping, dating rich men and being seen at Shanghai's hottest night spots. "In terms of where Shanghai is going, it's already the greatest city in the world: it has the best Chinese DJs, the most beautiful girls for miles and the richest foreigners in the Yangtze River delta. I think any future progression of the city could only be seen as a regression. I hope it doesn't change at all, but if it does I want to be at the forefront of that change, wherever it may be." Wherever Shanghai is heading, it will maintain its status as the place to be and be seen, on that the Shanghainese can agree.